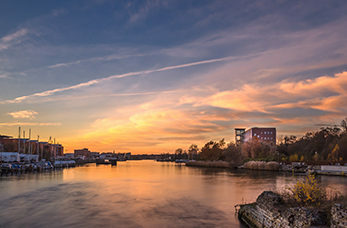 Kiel, the capital city of the German state of Schleswig-Holstein, today its famous for its Canal which begins here and stretches some 60 scenic miles from the Baltic to the North Sea. The city of Kiel was severely bombed during the Second World War however it maintains much of its medieval character. St. Michael's church is the most famous church in the city of Hamburg. Considered to be one of the finest Hanseatic Protestant baroque churches of Northern Germany. A big attraction for locals and visitors offering popular boat trips and walks, was originally created as a water reservoir for a mill. Famous for its beautiful Neo-Renaissance facade dating back to the 19th century, the city hall still houses original governmental functions. Experience an authentic piece of old Hamburg, as you explore the shops and museum where you can reminisce of how life used to be in Hamburg in the 17th century.